Discussion in 'Downhill & Freeride' started by Transcend, Mar 4, 2008. Yes, there is already a desktop thread, but it has sort of evolved into any and all Dh pictures, so I figured I'd start a new one just for desktops. Here ya go. Right click save as. 1680x1050. 2008 season has started! How about one from last year? Right click, save as. 1680x1050. That second one is pretty dope... and it should be fairly easy to Photoshop out the Transcend logo too! Can we post other ones we have here? This is transcend's thread, with his pictures. Posted to get praise and flattery, so that he feels better about all the money he's sunk into camera crap over the years. I also own the intarwebz you are surfing on, so beware! i haz [blue squares] ? [blue squares], not pixxorz. what's the deal??? I can has torrent new britany album? I banned her from the webz, sorry. I am slowly going to implement all of China's firewall policies. That shot of Fairclough would be sick if he was wearing a helmet, so his goofy mug wanst on my background. o.k., seriously, why do i see blue squares instead of pics? am i on transcend's block/ignore list or something??? Err nope, you should be seeing them? I am not aware of anyway to blocked images from users?? They do not appear here either. didn't appear here either until i opened them in a new tab. i'm on a mac with safari, you guy having trouble on safari too? Whats that on minnaar's bar between the break lever and the grip? Looks kinda like an X.0 clamp but nothing appears to be attached to it. Maybe a matchmaker? Weird, I am on a mac using Safari as well. 3.0.4 under leopard. 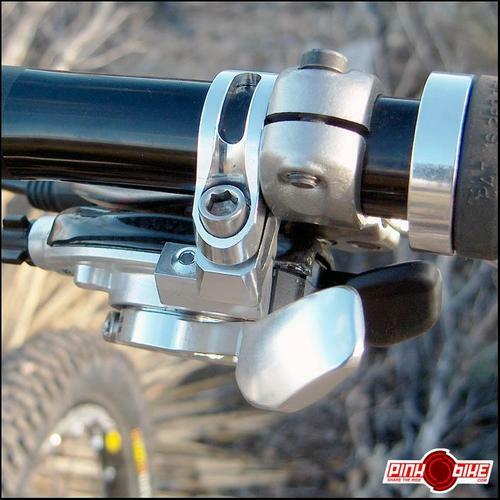 its just his shifter clamp for his XO. But I think your right on the one on the left as there is no cable going into it. most likely the button for the electronic shock lockout the Honda guys had to help them get out of the gate quicker. Apparently the RN01 was not the fastest accelerating bike to grace the world cup circuit. If you zoom in on it you can see it is a little wire that does go to that electronic "jimmy button" of sorts to get that bad boy out of the gate...Big Time! Pretty fancy, Honda really brought a lot of cool technology to the race scene, I'm gunna miss it. Nothing as cool as a suspension design that pedals efficiently from a standstill though eh? I have XP pro and they show up. edit: Here's one of mine. yup little clone stamp and WALA!